The last 6 months of my life have been a huge transition period for me, in learning to become a more happy mom, despite a chronic illness that has entered into my life. Despite my struggles, I’ve started to glimpse what happiness really is and unfortunately I had to reach my all-time low to figure it all out. The thing is….motherhood is really challenging. That will never change. I’m not about to give magical tips with a promise that motherhood will turn into a blissful walk in the park. But what I have learned, is that you can feel powerful joy and happiness–even on the hard days. It just takes practice. Who are YOU? This is huge. Because parenting can be so demanding, many parents get lost in the day-to-day tasks and forget who they were before they became a parent. Do you have hobbies? Things you enjoy doing? Are you doing them? If not, something needs to change. As humans, we are made to be unique and creative. We all came here with unique personalities for a reason! We were meant to progress and BECOME! 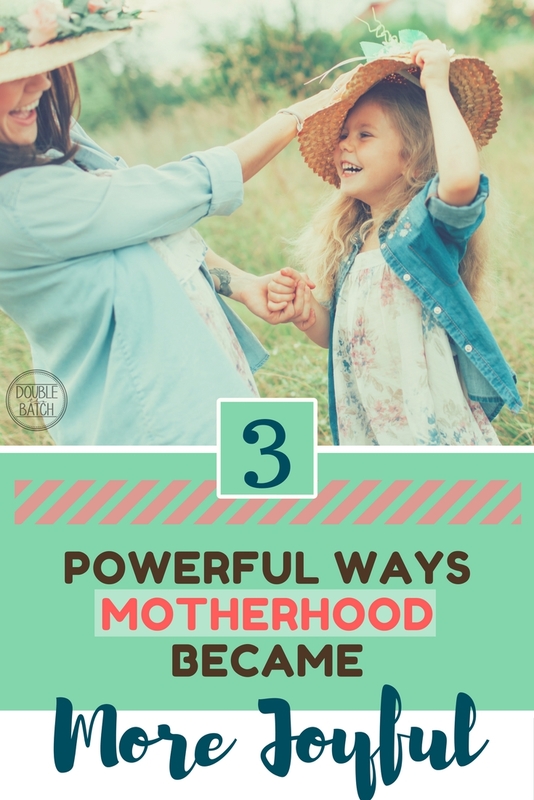 If your day never varies beyond sippy cups, diaper changes, and Curious George, then of course it will be more challenging to be a happy mom! For me personally, I find great pleasure in starting a business in the evening hours after my kids went to bed. It stretches me, causes me to think more deeply, and also encourages me to use my creative mind. I also found that making time to sit by myself and read an inspiring book, has made a huge difference in becoming a more happy mom. Think of at least one thing that you would really enjoy doing if you had time to yourself, and make sure to find a way to do it! Even if you have to trade babysitting with another mom, get your spouse to give you a night off, or hire a babysitter every now and then during the day. Whatever you do, don’t give into GUILT for doing something for yourself. When you do things that contribute to being a more happy mom, your children naturally benefit. There may be times that you need to find balance and tweak how you do things, but don’t ever give up your identity as a creative being beyond just being a “mom.” You have several more titles! It’s still amazing to me the shifts that occurred in my life once I took control over my thoughts. My symptoms became much more manageable (and even non-existent at times), and my life became happy and exciting. When I found myself with thoughts like “my health is horrible,” I would quickly change it to, “My body is healing. I’m grateful for the journey.” IT MAKES A DIFFERENCE! My body started listening to what I was telling it, and I have experienced a lot of positive change from my thoughts alone. If you read my article on getting rid of shame-based thoughts, you can learn more about how I started to change my thoughts. This has been the number one contributor in becoming a more joyful, happy mom. Be Active. This last tip isn’t just about exercise, although I do consider exercise to be a big part of mental health. No, when I say “be active,” I’m more talking about being actively connected to your body and what’s going on. Tap in the the emotions you are feeling and give them a label. Things like, “I’m feeling tired” or “I’m feeling frustrated.” Make sure you label what you are feeling, rather than attributing feelings to what you ARE (“I am frustrated”). Once you have labeled them, give gratitude for them, and release them. The gratitude part is important–being able to feel emotions is a blessing. It’s once we start to stuff our emotions and become numb, that our ability to feel real joy and happiness is limited. My greatest tool for emotional health, is to connect with nature or do yoga…..as hippie as that may sound. It totally works. I never used to do yoga because I considered it the “sissy exercise” and thought it was boring. Now my body craves it. It is my favorite form of exercise because you are getting mental and emotional benefits with the physical. Every time I do yoga, I use this time to practice positive mental thoughts and imagery. When I am in a mountain pose, I imagine angels lifting me and stabalizing me. When my arms are outstretched, I imagine myself releasing stress or negative emotions and energies. When I am in a position with my head bowed, I imagine myself asking God for help, and giving me strength where I may fall short. THIS HAS BEEN VERY POWERFUL FOR ME. At first I just did it because I figured it couldn’t hurt, but now I know it works. Powerfully. Especially when done consistently. For me it is a form of prayer and mediation and as a benefit my body is also becoming stronger and more flexible. It sets intention for my life, and gives my body a path for healing.